Rugby and tree planting may seem an unlikely combination, but over the past three years they have come together in a spectacular way: the Living Legends project. 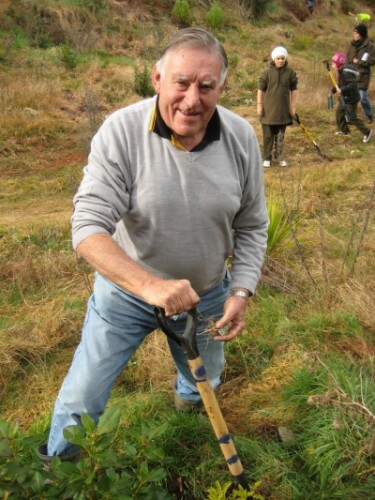 17 “Rugby Legends” including Sir Colin Meads, Sir Brian Lochore and Todd Blackadder have joined over 8,000 New Zealanders to plant 170,000 native trees throughout New Zealand. Living Legends will continue to manage each of the 17 planting sites for the next two years before they are officially handed over to the Department of Conservation, or in some regions, the local Council. Living Legends is a joint venture of Project Crimson, a conservation charity with 23 years experience in community-based native restoration projects and The Tindall Foundation. Major sponsors are the Department of Conservation and Meridian Energy. This entry was posted on Monday, September 16th, 2013 at 1:12 am and is filed under News. You can follow any responses to this entry through the RSS 2.0 feed. Both comments and pings are currently closed.